This is a hand-raised silver bowl with cloisonné enamel on the inside. The rim has the addition of 18ct gold wires that are reminiscent of the gentle lap of waves on a sandy beach. The gold set labradorites symbolize tiny pebbles in the sand whilst the moonstones derive from bubbles in the surf. 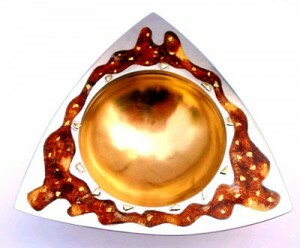 The bowl has a separate base so it can be positioned at an angle to better admire the inside. The hand-raised silver bowl has a gilded interior for salt. 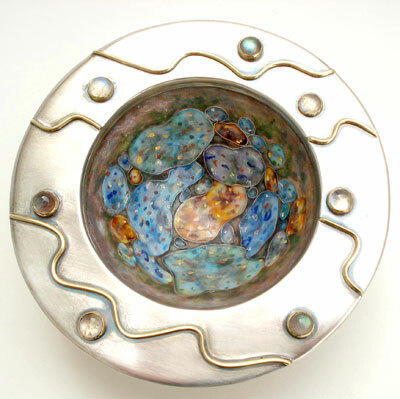 The out sized silver rim is enamelled with the addition of gold foils. There is a separate silver base so it can be re-positioned at an angle if desired.